Sorry I botched Yes_Man's validation. He should probably go away. "Fancy meeting you here, friend." Ok, I'll take care of it. Thanks. ....when you consider that Venezuela is a petroleum state, whereas Argentina and Chile not, and that the price of oil went from $27 to $90... it's a disastrous result. But Chavez succeeded in creating a cult of the personality placing himself next to Christ. 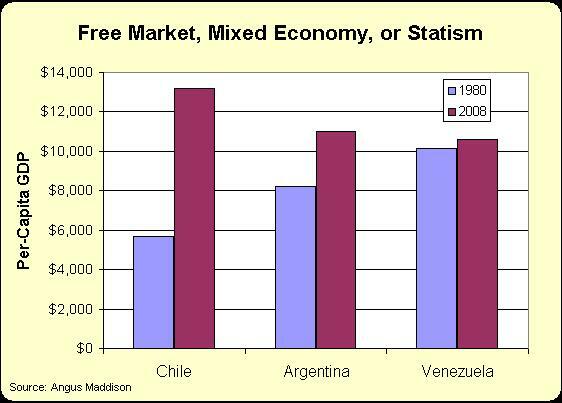 Disastrous economicaly but as propagand the Chavistas do top job mixing socialism and christian cults. See the millions of fanatics mourning his death for weeks. For some lower class he is the equal to Christ. For such a result he must have quiet astutely and equaly distribute oil revenues. I dunno... most supreme leaders fatten their own pocketbook first, strewing just enough scraps to the mob to keep them satisfied. Few such tyrants are remembered for very long by their mob groupies. CARACAS, Venezuela — Venezuela's acting President Nicolas Maduro squeaked out a closer-than-expected victory to serve the remaining years of the late Hugo Chavez's presidential term in an election marred by irregularities. Hmm.... Maduro's win was anticipated given the popularity of Chavez among have-not's... but with such a close vote one wonders if the elections were fair or of the Obama-Romney type? Fair compared to what? Compared to other socialist elections? Since the time honured principle of "The ends always justify the means" my guess is that such a tight victory really means that a recount could well do in the official hand picked successor, ending his career before it starts. I'd be surprised if he didn't roll out the troops, declare martial law, and squash any attempt to see what really happened. When I read the news this morning, I was certainly shocked. I expected the 'official' results to be much higher for the socialists, knowing how capable they are at creative mathematics. But regardless, even if he officially does win, the bloom is off the rose, and no amount of huffing and puffing is going to bring back the past. fair in the one man=one vote sense. Several analyses I have seen were sure of Maduro's win even with no manipulation.... something like 70:30. Well, it certainly wasn't 70:30. Perhaps some of the manipulators freedom to manipulate died with Chavez? I'm myself surprised how little votes Maduro had given the campain add advatnage he had and given the huge attendance at Chavez' funerals. Venezuelians must be fed up with the sociliast Chavesta regime IMO. (04-15-2013, 04:35 PM)Fredledingue Wrote: I'm myself surprised how little votes Maduro had given the campain add advatnage he had and given the huge attendance at Chavez' funerals. Perhaps they too have had a chance to study Dan Mitchell's chart, and realize they should be far ahead of Chilie, considering all of their natural resources. Looks like we now have an official scapegoat for the new administration. The winners always get to make the rules - but isn't it fun when the losers finally get control and try to right the ship? It doesn't look like Maduro has much staying power. Maduro has already been recognized by many SA states, including Brazil, even though the "audit" of the vote was instigated. Is there any doubt about how this "audit" will work out? The ghost of Uncle Ugo is still at it: Venezuela orders temporary takeover of toilet paper factory. Obviously, from a Collectivist's POV, this will easily solve the problem. Quote: What to do if your country’s economy is on the ropes, inflation is soaring, shortages are rampant, political support is fragile and violence is flaring? For critics of Nicolás Maduro, the president of Venezuela, the answer is that you wrap yourself in the national flag and blame somebody else, anybody else, even Spider-Man. Does this sound like what one can expect from Obama, when the economy tanks? It'll be somebody else's fault, including Junior. We'll just have to see how long the citizenry tolerate Maduro before throwing him out. But to be fair, the real villain is Uncle Ugo. Too bad he had to go and die on everyone. If there is anyone who knows how to make the perfect exit from the Main Stage, it has to be Uncle Ugo. After forcing Venezuela on to the guaranteed path to Socialist Nirvana, he had the gall to leave prematurely. Now his successor has assumed all of the blame for a system that will never work, in spite of being blessed with natural resources, such as oil. And guess who is going to get all of the blame? This is guaranteed to set up more rounds of Socialist Wanna-Bees, who will claim to have all the answers and willing to build on Uncle Ugo's dream. What fun Venezuela is about to undergo. LOL! The path of Collectivism is always the same. Sooner or later, it is just as Margaret Thatcher said about always running out of other people's money. And then the only recourse is to scapegoat others, followed by an attempt at tyranny. And Venezuela is no exception here. The sixty-four thousand dollar question is going to be just how much blood he is willing to spill before he comes tumbling down. And will the military actually prop up a former bus driver and union hack. Wrote: The authorities have ordered businesses to slash prices and people have flooded shops to take advantage of discounted items ranging from car parts to electronics and sports shoes.